As you can see from the photo’s below, the junior library is now complete. 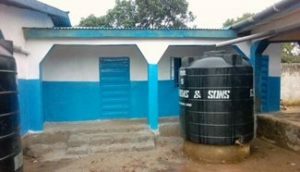 We are going to re-locate the water tank, shown on the right of the picture below, to a more suitable position where it will not cause an obstruction and it will collect water from the existing classroom block and the library room – this work will be completed this week. We continue to thank you and your supporters, for making GREAT differences in our communities, especially in our Liverpool Schools. Our community is very proud to have such wonderful facilities that have benefited, and will continue to benefit, generations yet unborn. You have delivered our children from total darkness to a brighter future with promising opportunities. We will ever be grateful to you ALL. 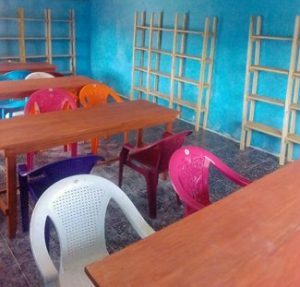 We still need to finalise the purchase of all the text books for both the junior & secondary school and the equipment for the laboratory. Westminster Group Foundation - Registered charity number 1158653. Westminster House, Blacklocks Hill, Banbury, Oxfordshire, OX17 2BS, United Kingdom. © 2014 Westminster Group Foundation. All rights reserved.